Get your random news here! It's randoriffic! I've already spent time in this space talking about the need to find time to write, so imagine my surprise that after the thirteenth entry, I'm now so buzzing with ideas that the writer's block was sufficiently in place. I even tried the suggestion of scheduling time to write, but it was interrupted with a night of clearing out my email inbox and a second night of falling asleep with my laptop open after eating a big slice of cake. I'm sure many can imagine the sight of me with a laptop open and completely sawing logs, but trust me, it's not nearly as entertaining as my words make it sound. 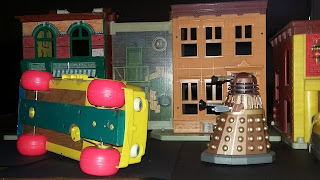 It's just that there are too many ideas for me to flesh out in a full entry, so I'm trying something that I used to employ back in my old blogging days - the dreaded composite story! Just consider this my version of a clip show without the flashbacks to explain the various jumps in story, and you'll get the program here. The inspiration for this comes for a very odd place - my American Government class back in high school during my senior year. My teacher, who was also my long distance running coach, made an executive decision in the fall that we would have reading time during the week. To help us in this endeavor, the school would bring in copies of this new-fangled national newspaper full of colors and graphs. You guessed it, it was the infancy of USA Today, and we were at the forefront of it. After the sports section was pulled out of every copy (it took him a month to remember to do this before it really happened), each student got a weekly copy to read for 30 minutes. I rather enjoyed the Money section as I had become interested in the stock market and money indexes, which inspired my eventual choice of major in college, Economics. I read through the States At A Glance section to see what news Idaho had made that was print worthy outside of natural disaster information or "You won't believe what this person did". But my attention always turned to the column of that famous news person, Larry King. My vantage point for Timbers when they play here. 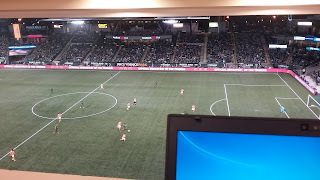 Timbers v Crew: It was going to be a struggle with Darlington Nagbe and David Guzman both on international duty, but overall, I thought the effort wasn't bad. Fanendo Adi and Dairon Asprilla both scored in the first half, but the Crew were able to counter the goals and took the 3 points with a late goal from rookie Niko Hanson in his MLS debut. Asprilla wasn't as adept defensively as Nagbe, but the real big adjustment was Amobi Okugo trying to fill in for Guzman. 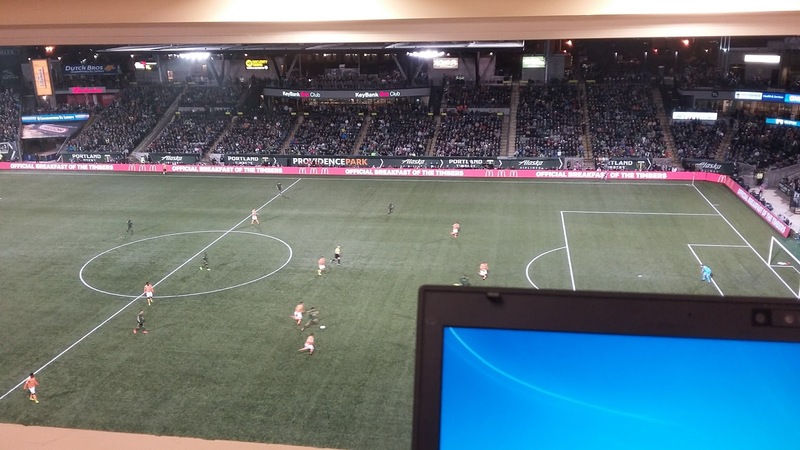 It's a lot to ask anybody to duplicate what Guzman brings to the Timbers, but it was obvious Portland had trouble covering space when the Crew pressed. This forced some adjustments from Jake Gleeson, Lawrence Olum and Alvas Powell, but not enough as the Crew were able to create chances and get the home win. While I don't completely expect that Portland can replace Nagbe and Guzman if they are both gone, the dropoff in effort and performance isn't as dramatic as we've seen in previous years in terms of talent. It's only 1 match and Portland wasn't going to go undefeated through the year, but there were some areas of concern for me - the passive approach in the second half that let the Crew dominated the possession, some of Gleeson's decision making (to leave the line or not), and who can fill in for Guzman long term. There's plenty of time to work out Guzman's back up and possession isn't always going to be that one sided, but I hope this isn't a sign of issues to come. Raiders moving to Vegas: I love Las Vegas and visit quite often, so when the news that the NFL is going there, it was exciting for many reasons. Growing up a Denver Broncos fans, this situation might actually improve my ability to see them in person instead of trying to find seats in Denver, an arduous task at best. However, I'm also upset for many long time Raiders fans - my father being one - for losing their team. He's loved the Raiders for as long as I can remember, and while he hasn't been to a game live, he watches them every week on his satellite TV service. When they left Oakland the first time in 1982, my father stopped watching games in protest as he was so frustrated about the move, but he eventually came around and forgave the team. Upon their return, he made another promise to finally get to Oakland, but that never happened as they will move to the Nevada desert in 2020 and he's not interested in going to see a lame duck side. For me, it's ironic that for being such a popular league that is making money, the Raiders are 1 of 3 franchises that are moving to a new location because their previous city decided not to pay for all of or part of a new stadium - St. Louis to Los Angeles, San Diego to Los Angeles and now Oakland to Las Vegas. As an economics major and sports fan, I firmly believe that cities and teams need to work together on facilities to ensure both sides can feel invested in the process, but no team should hold a city hostage to get a new facility. If a plan is done right, it can work wonders - just look at the Timbers' stadium deal in Portland as an example of happens when good policy benefits everybody. #EpicFailFriday for #WillMyBusArrive: After sharing the story of my transit experience, I've now experienced some of the worst service that I've witnessed ever from the local transit company. I can understand situations and accidents happen, but for the past 2 Fridays, my bus line has had 1 bus make the regular timetable between 4 pm and 6 pm when there are 5 regular scheduled runs at each half hour. On St. Patrick's Day, no bus appeared but I was able to get a ride home; on the following Friday, I got a lift to the Rockwood DMV to catch another line to get me close to home. One of my biggest issues with our current bus service is that there is no notification system if a bus is not running for any reason; yet I can get emails about any delay within the corresponding train service telling me everything from elevators out of service to bridge lifts. To me, it's ridiculous that any modern transportation service can't notify interested riders via alerts of a bus delay within the same business day. I have an Android app that tracks buses by satellites and Google maps that is fairly accurate and approved by the company, but even it is clueless about missing buses until it's too late and I've already been waiting for hours. I've stopped notifying them of any delays because honestly, I'm tired of getting the standard boilerplate apology about it. At least for me, they seem to care about trains and little else, which is too bad for those of us that depend upon buses for our daily transport. Shadow Work, Part 2: This article that I shared back on March 15 has ended up being my most popular post so far, and I very much appreciate the many comments and thoughts that people shared about it. However, it also emphasized the toughest part about dealing with shadows - talking about it isn't nearly enough to deal with them. The best way I can describe shadows is put out by one of my favorite musicians, Travis Morrison, front man for the Dismemberment Plan in their song, the Ice of Boston - "Mainly because knowing about that would involve knowing about some pathetic, ridiculous and absolutely true things about myself that I'd rather not admit to right now." Shadows retain power unless you come up with ways to deal with them, and honestly, talking about them isn't nearly enough which is why breaking them is so difficult. I've dealt with trauma so much in my life that I hadn't realized that I've always operated with anger as a major operating force within it. It was very easy to find sources to fuel it as well, but I'm tired of living in that reality. Over the next few months, I want to talk about this process while being mindful of divulging too much to keep certain things private. It's great to talk about it, but it's also time to make some real change to overcome the shadows - and hopefully break the cycle because it's about time.